optional ingredients: vinegar, chilli peppers, cayenne, chilli flakes. Wash and dry eggplant and peppers. Cut eggplant into large chunks and quarter the peppers. Discard core and seeds of red peppers. Spray veges with a little oil and place in a single layer onto a parchment or aluminum foil lined baking tray. Roast for about 40 - 50 minutes or until it's wilted and the skin turns black. Place roasted veges into a heatproof baggy and seal or, into a heatproof bowl and cover tightly with plastic wrap and allow to sweat for about 15 - 20 mins. Peel and discard the skins of both veges. Place into a food processor together with the garlic clove, lemon juice, sugar (if using) and salt. Buzz a couple of times to a chunky puree and then slowly drizzle in the oil while the blade is still running, until well incorporated. 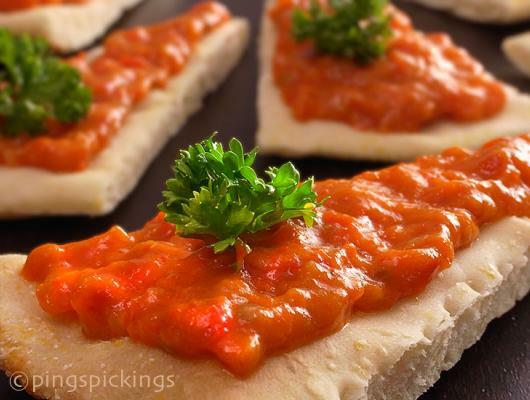 At this point, it's up to you whether you want the ajvar to be chunky or a fine puree. As you can see, I like mine somewhere in between. Sprinkle with chopped parsley to serve or put it into a clean jar and store in the fridge.